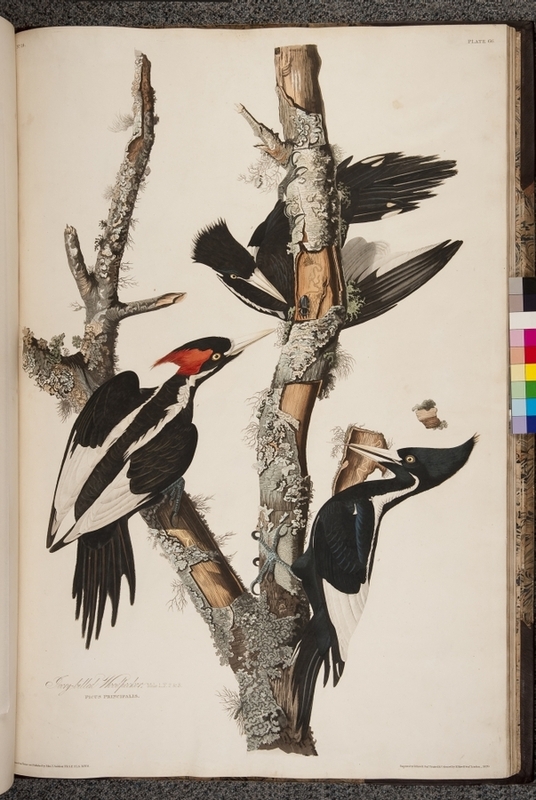 The birds of America : from original drawings / by John James Audubon, Fellow of the Royal Societies of London & Edinburgh and of the Linnean & Zoological Societies of London[,] Member of the Natural History Society of Paris, of the Lyceum of New York, &c. &c. &c.
This book was published over an eleven year period, 1827-1838. 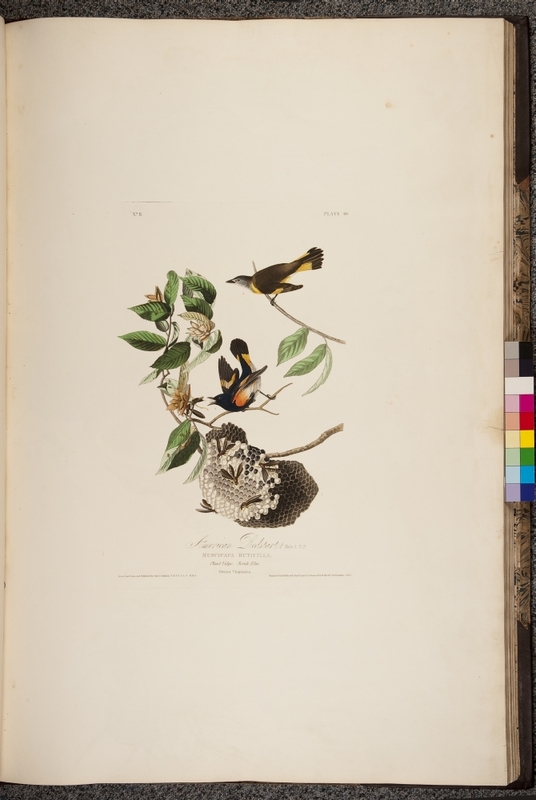 Fewer than 200 sets of the four volumes were printed. 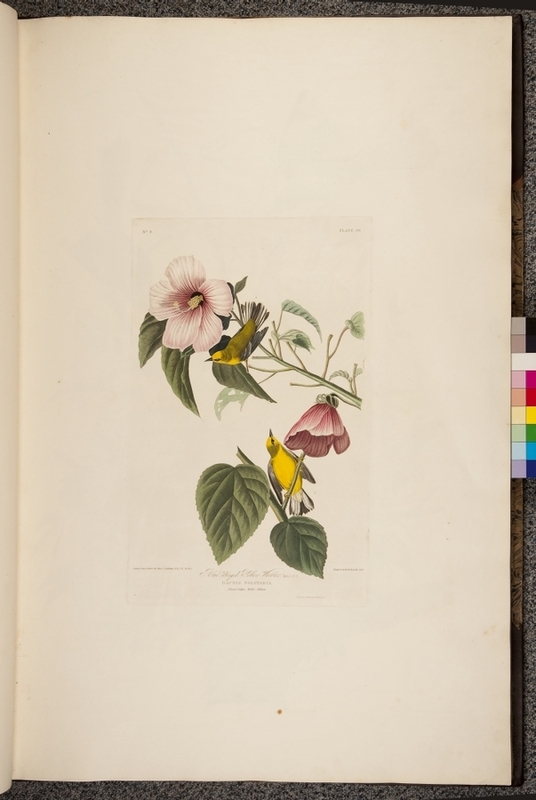 There are 435 prints in a complete set. 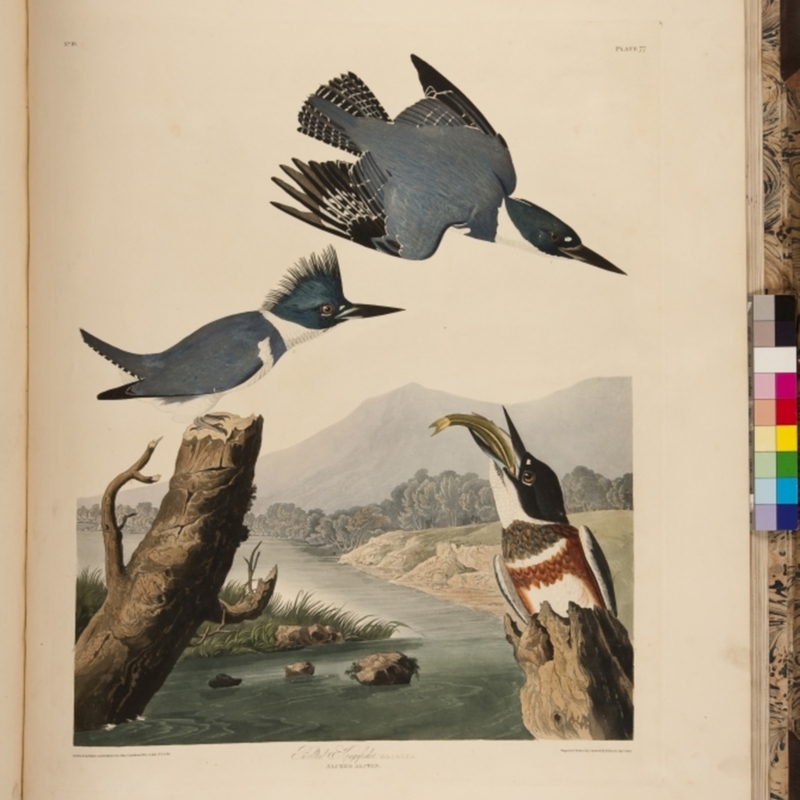 The College paid £48 in 1838 for its half set of prints 1-200, probably purchased second-hand after the original subscriber defaulted. 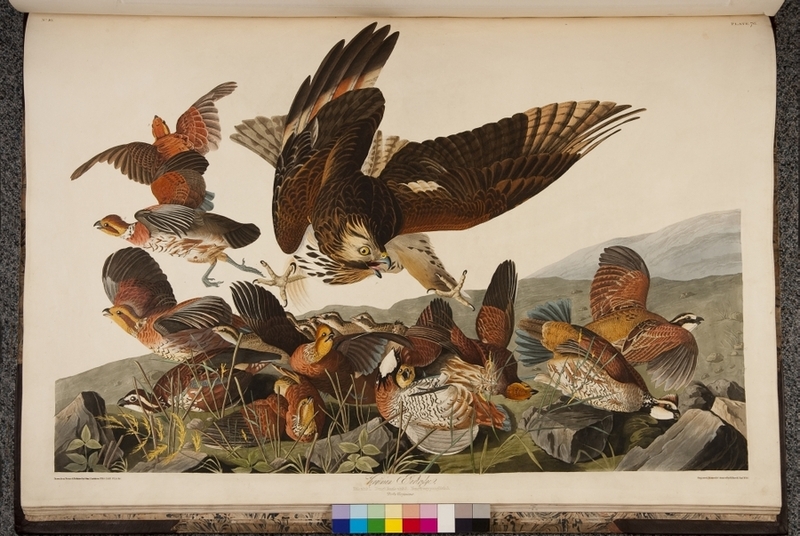 The prints were engraved and coloured in Edinburgh and London, under Audubon’s supervision, from his original paintings and drawings now held by the New York Historical Society. 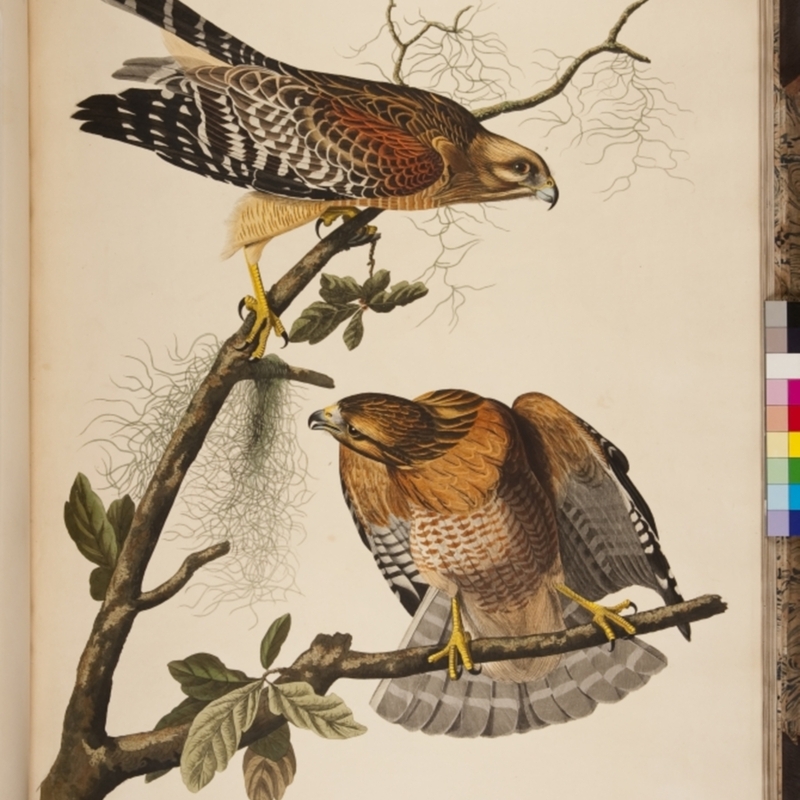 Although he portrayed the birds in lifelike poses, all were dead when painted. 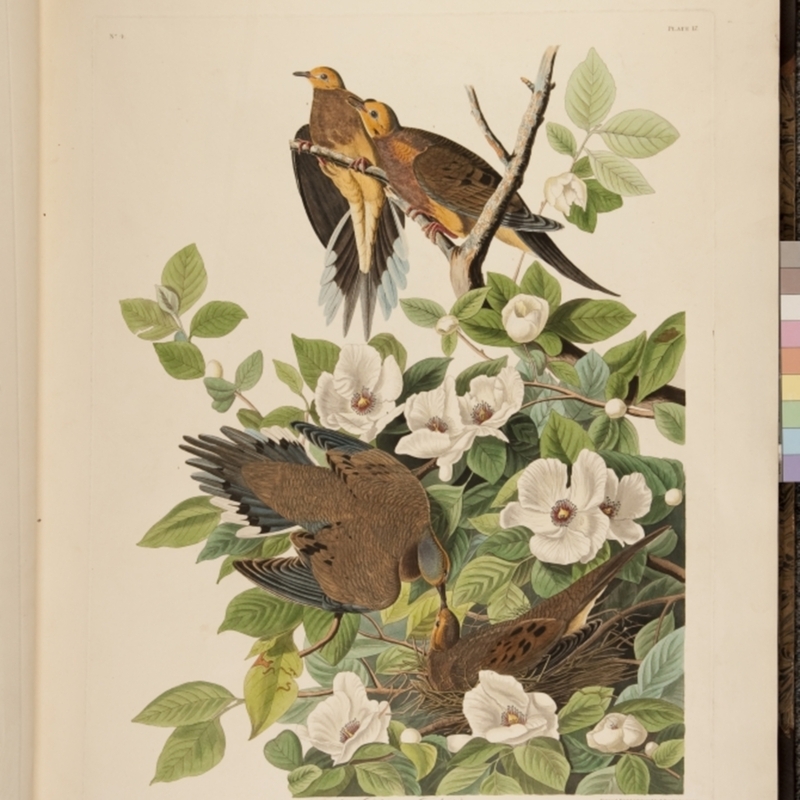 He shot the specimens himself then arranged them with wires on a firm base. 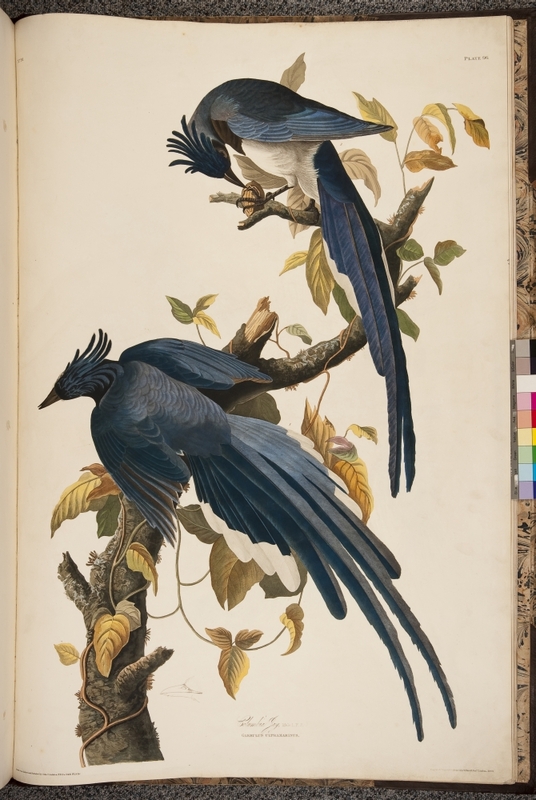 The book is double elephant folio in size to allow depiction of the birds life-sized, in their natural habitat and to be viewed from eye level. 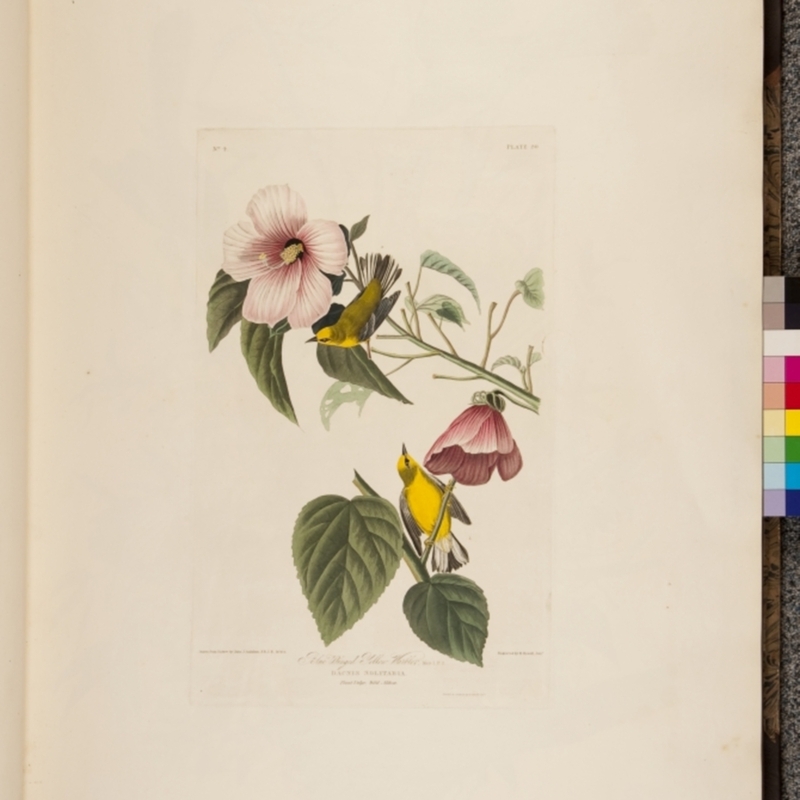 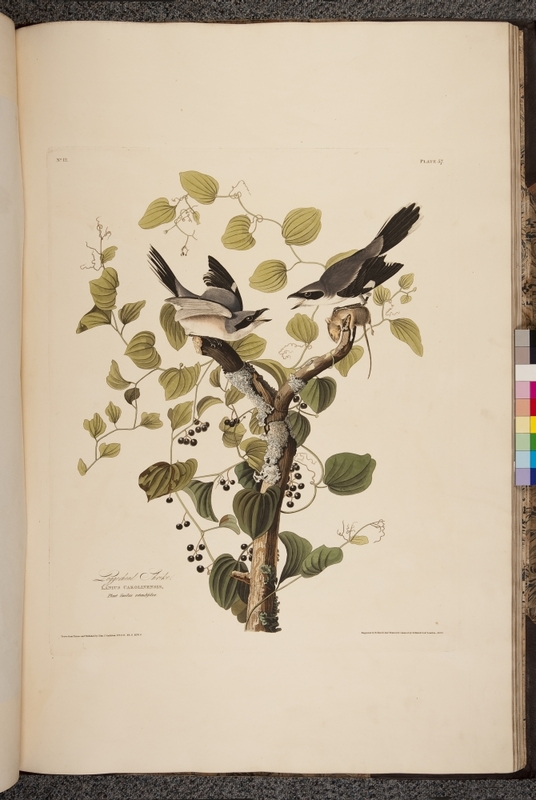 John James Audubon was born as Jean Rabin in Haiti in 1785, the son of a French naval officer, Lieutenant Jean Audubon and his mistress, Jeanne Rabin, a Creole woman who died later that year. 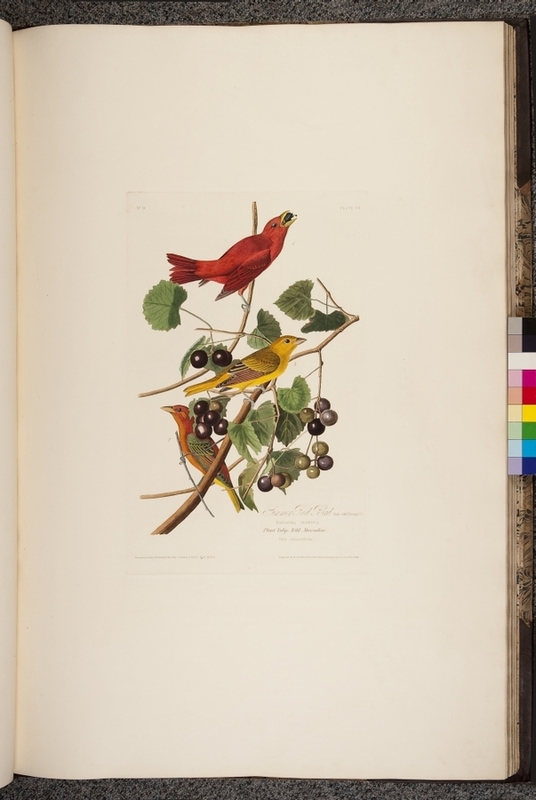 When John was four years old his father took him back to France and he was formally adopted into the Audubon family. He was sent to his father’s small estate near Philadelphia in 1805, perhaps to avoid conscription in Napoleon’s army, and it was here he began to study and illustrate American birds. 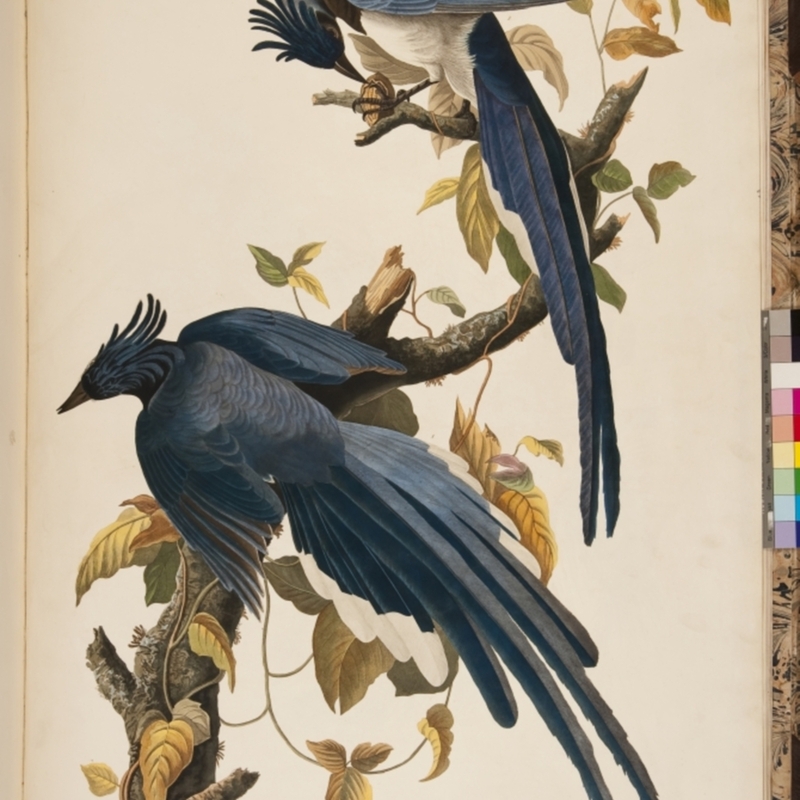 This was to be the major work of his life, and is one of the finest ornithological works ever completed. 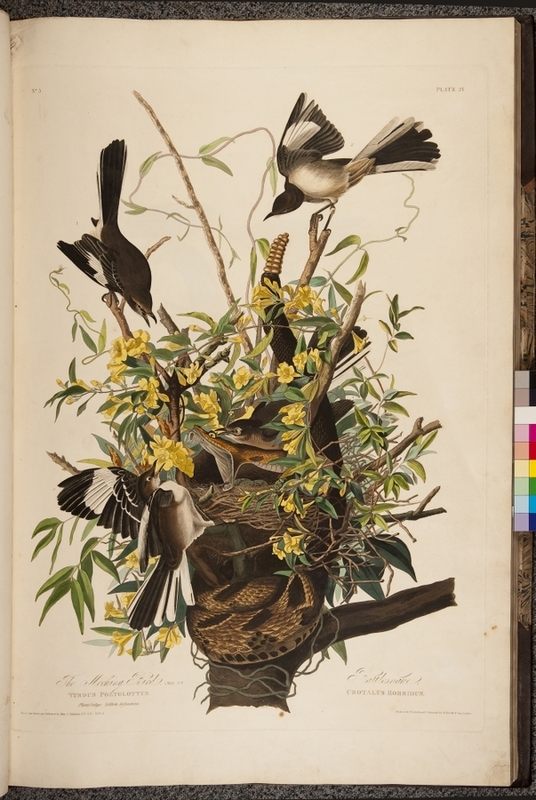 Audubon, Lucy Green Bakewell, 1788-1874. 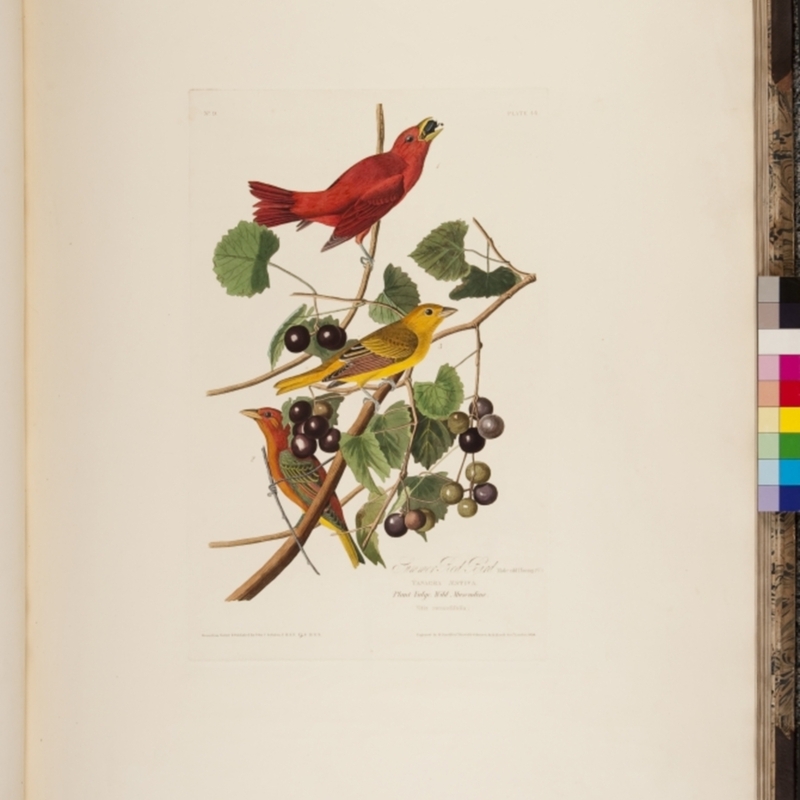 Lizars, W. H. (William Home), 1788-1859. 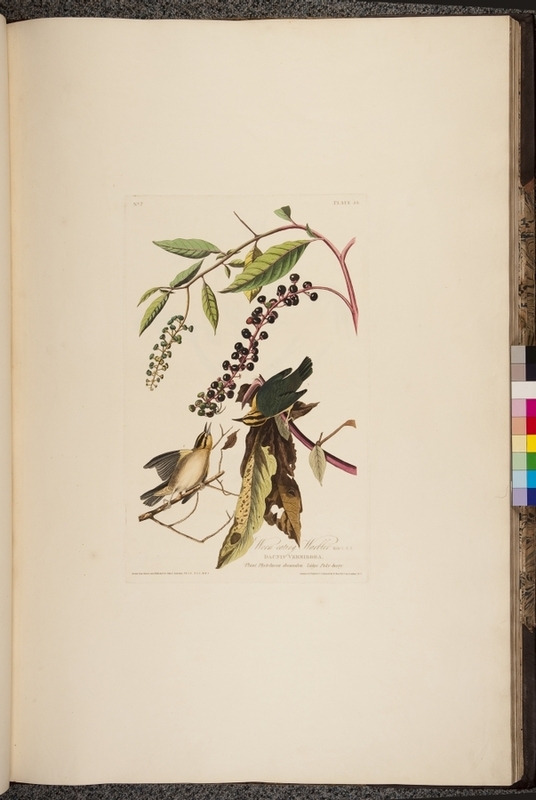 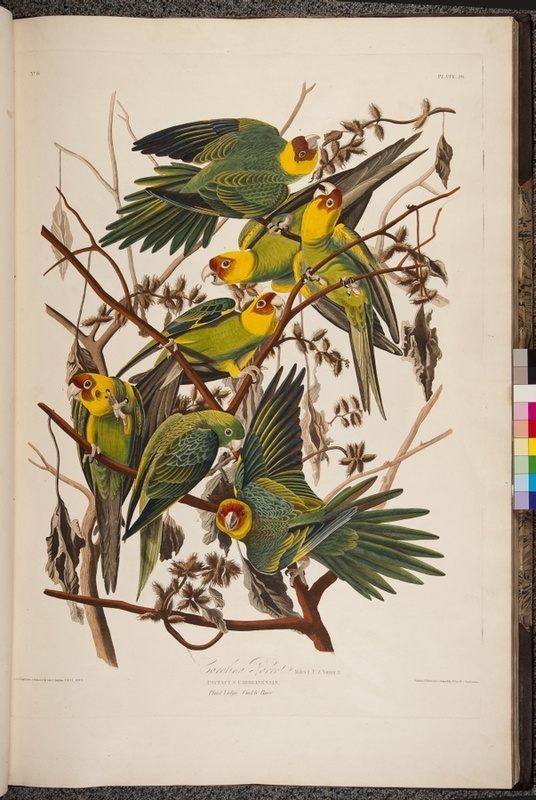 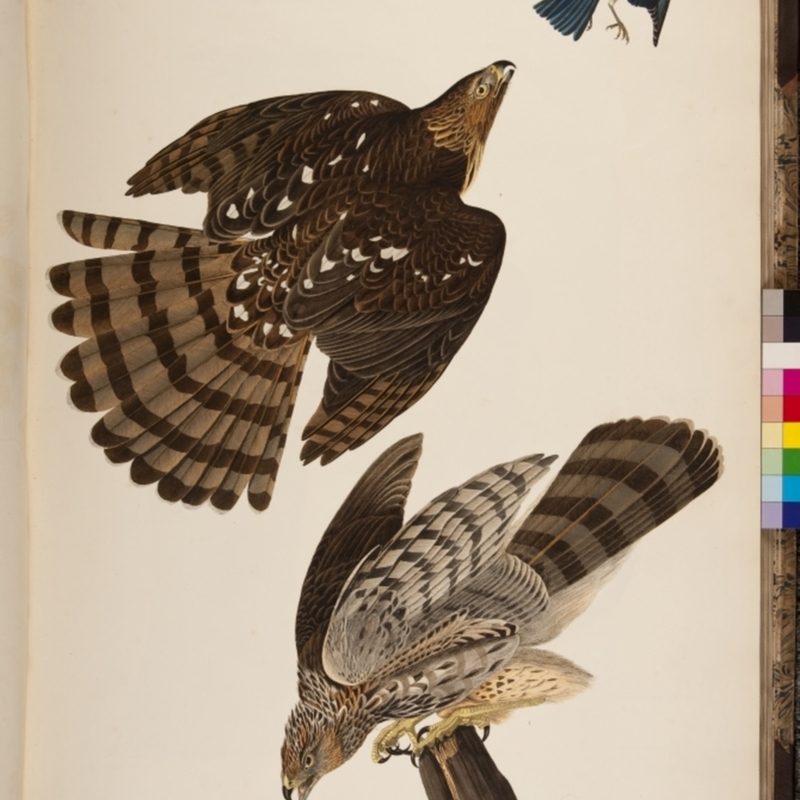 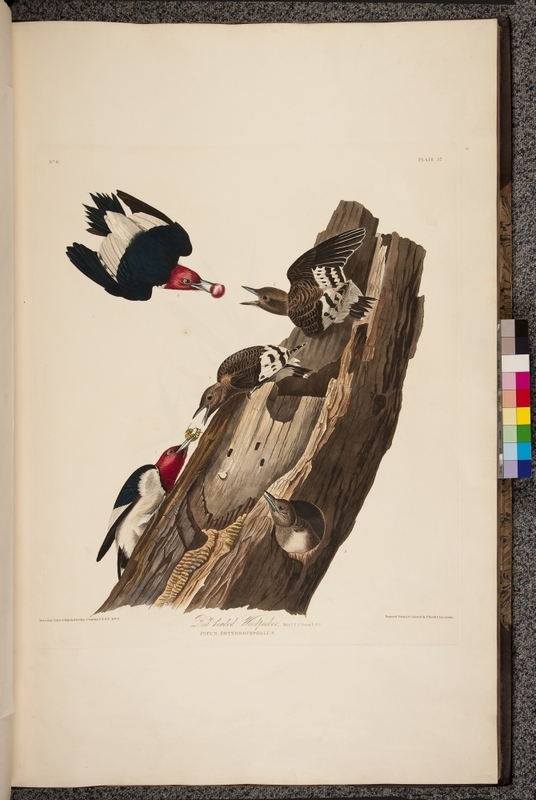 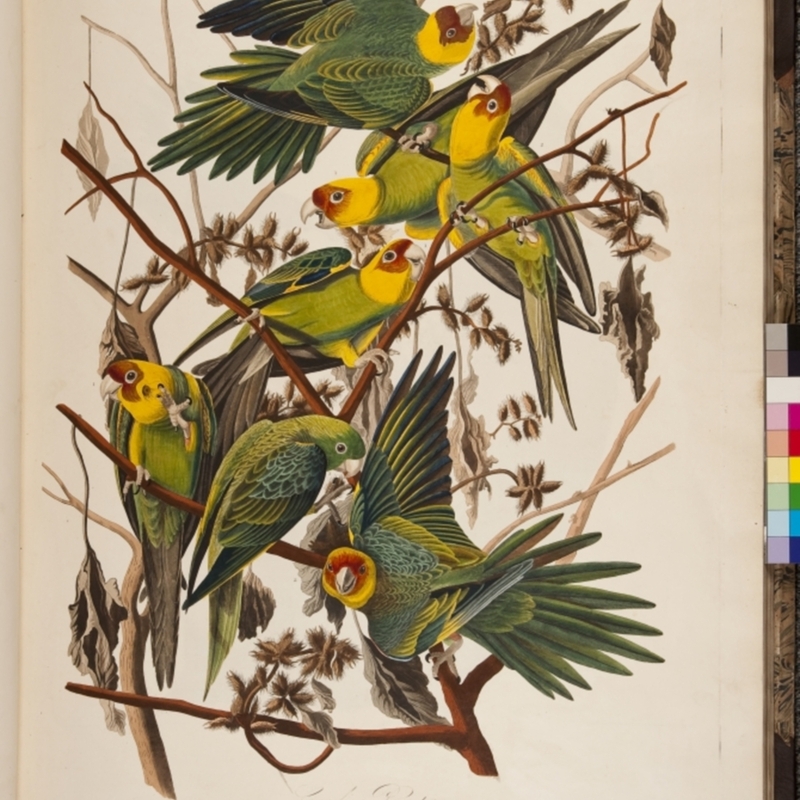 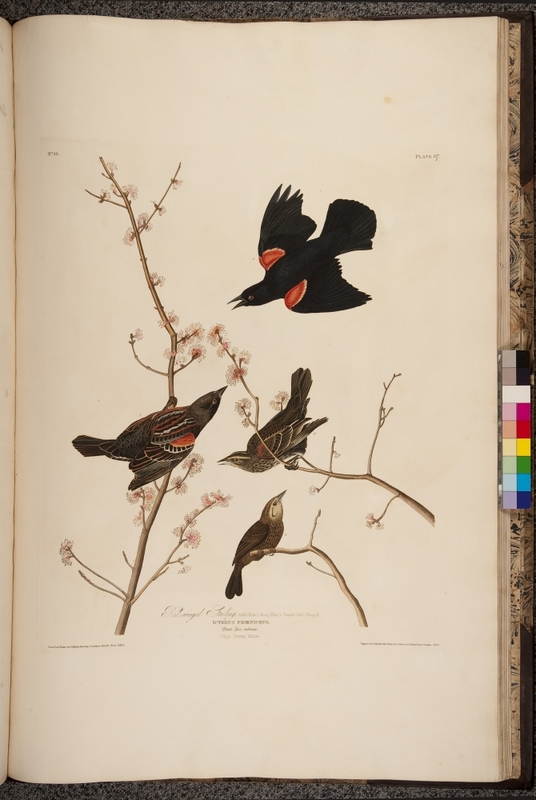 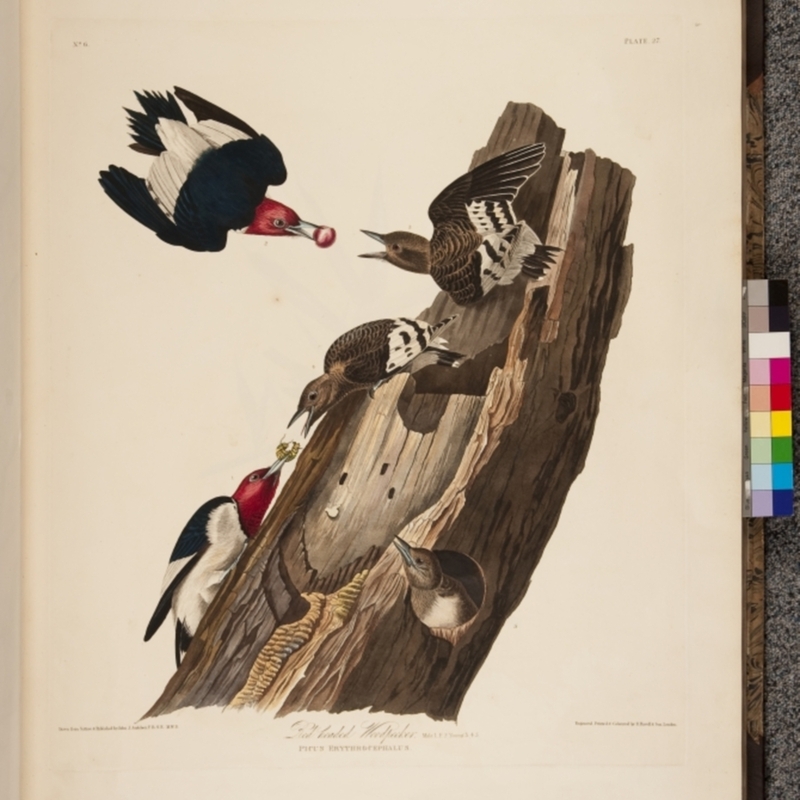 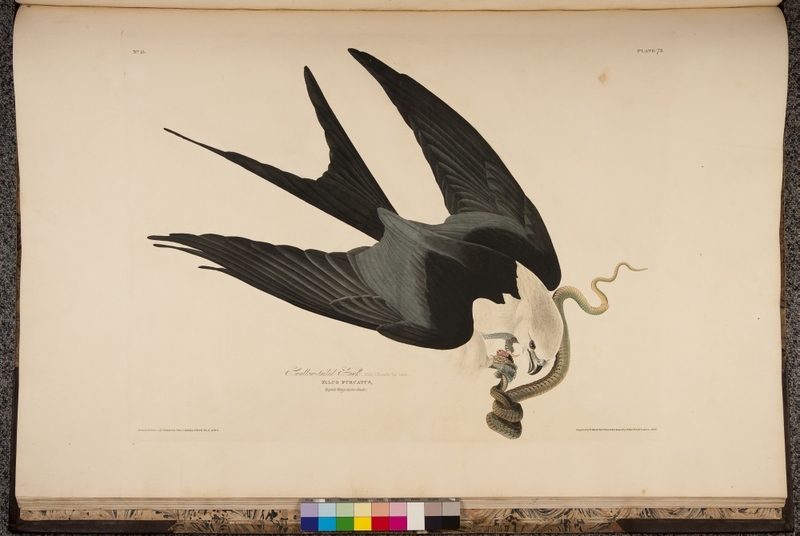 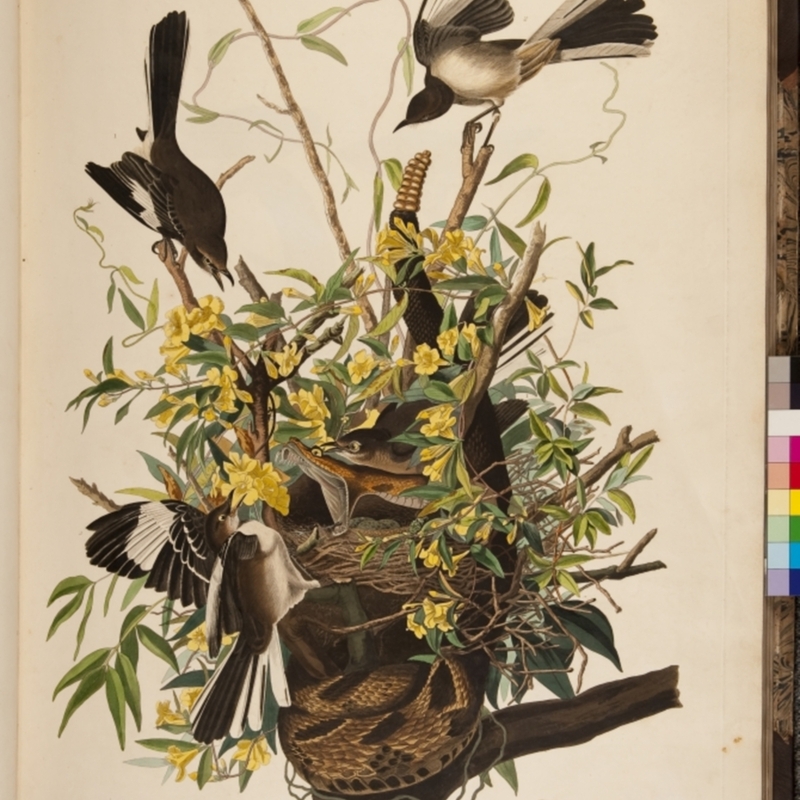 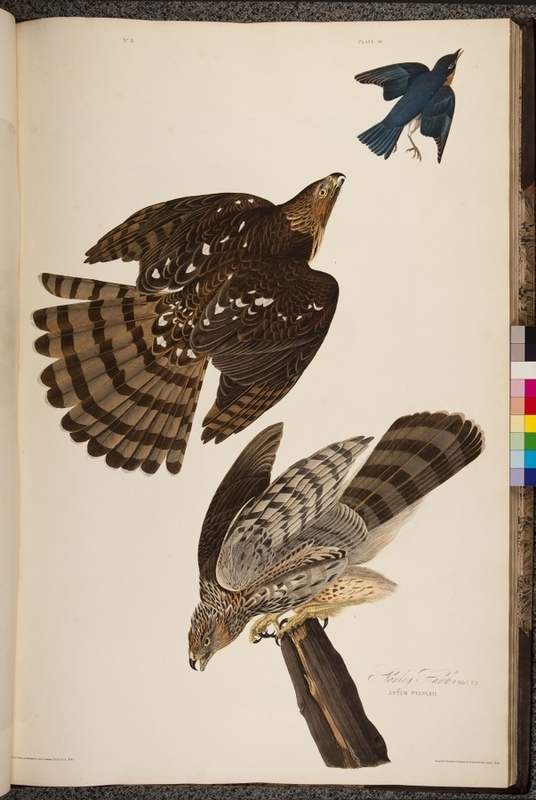 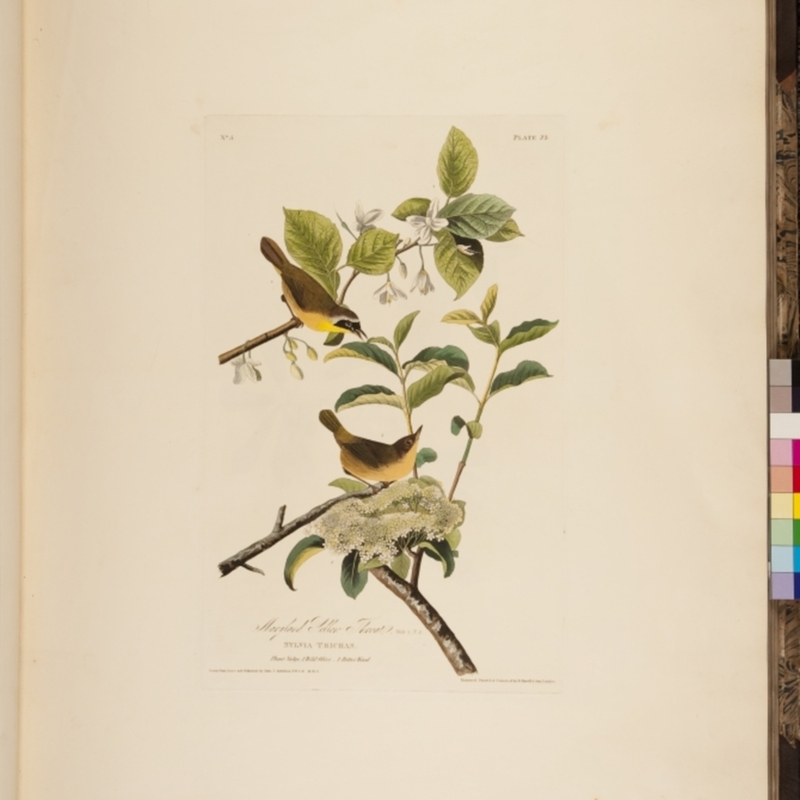 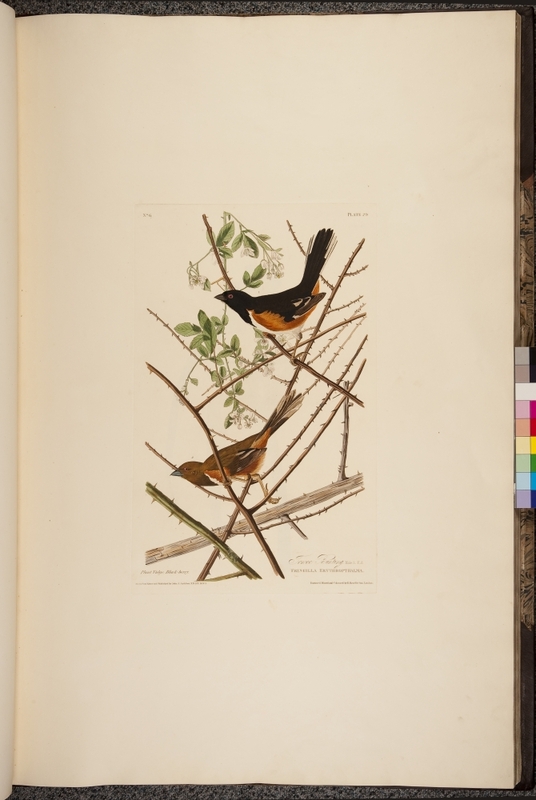 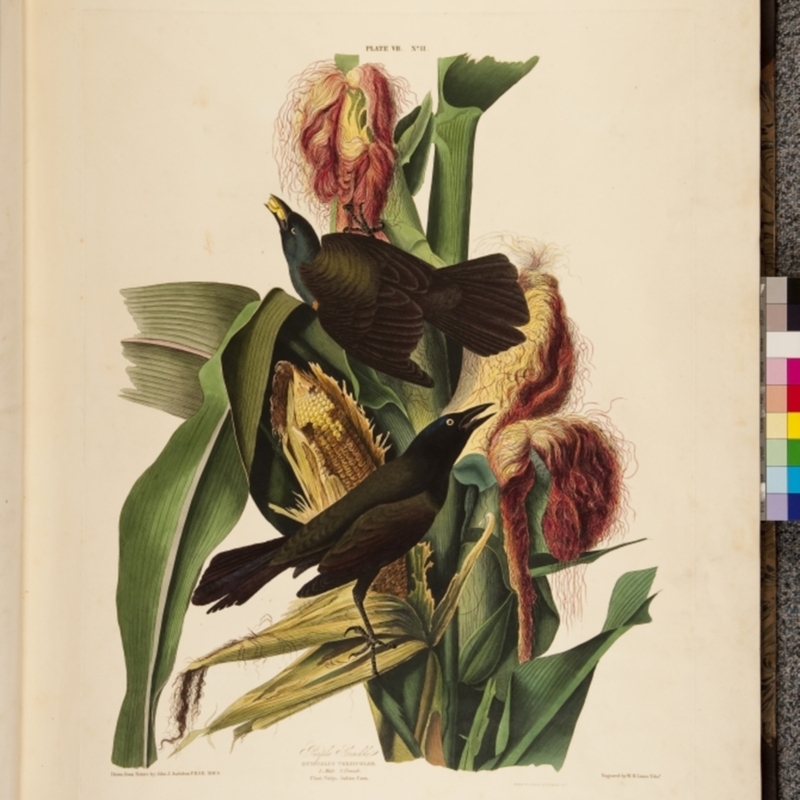 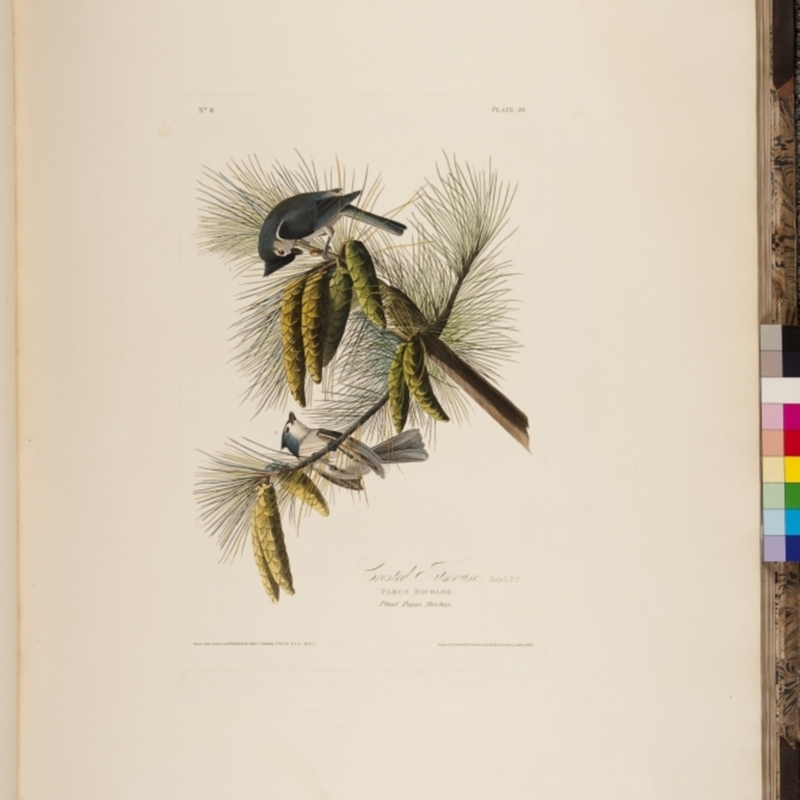 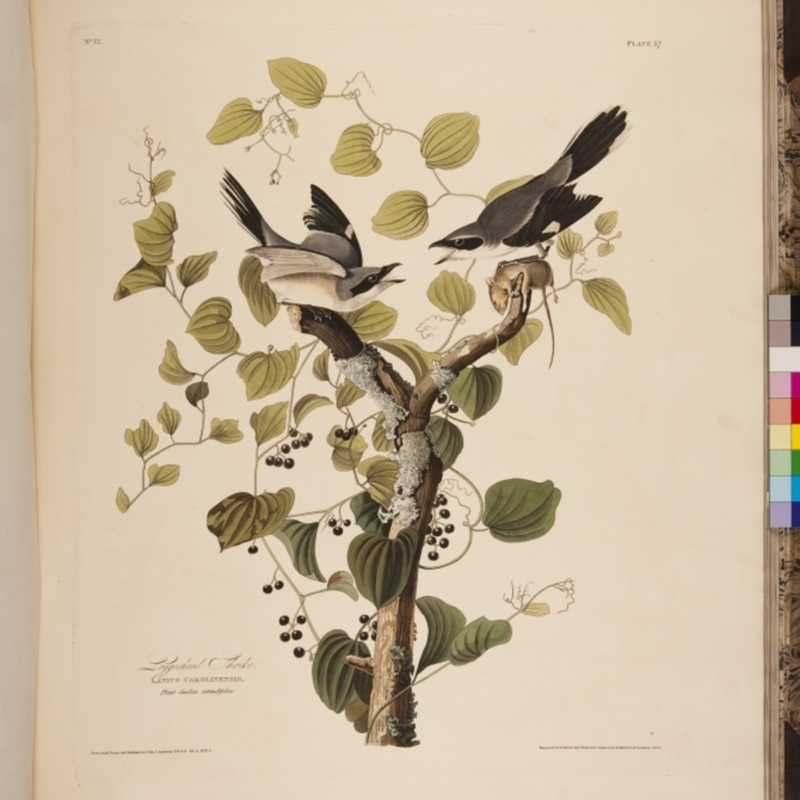 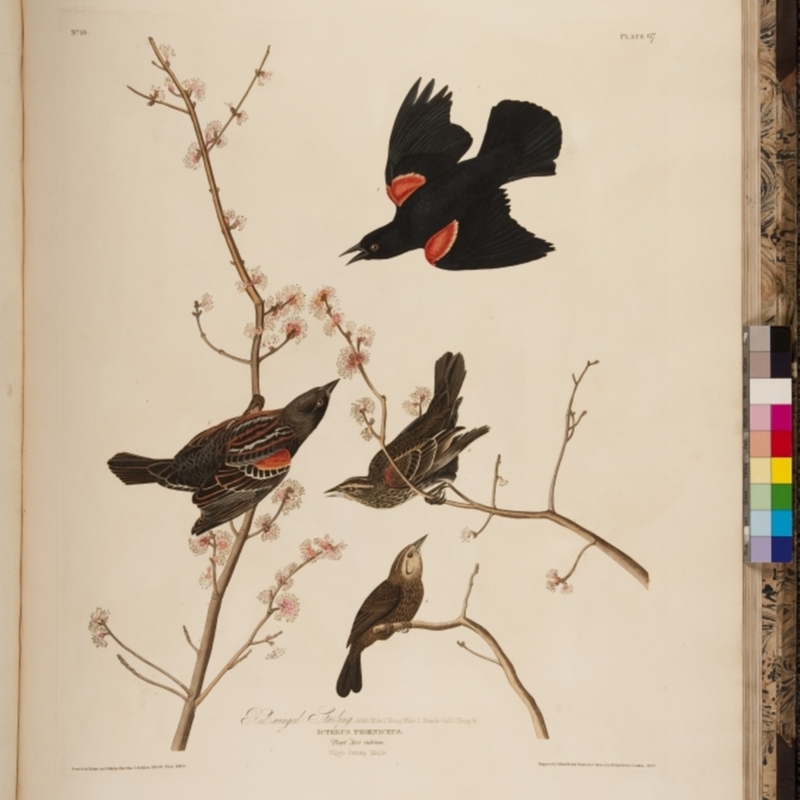 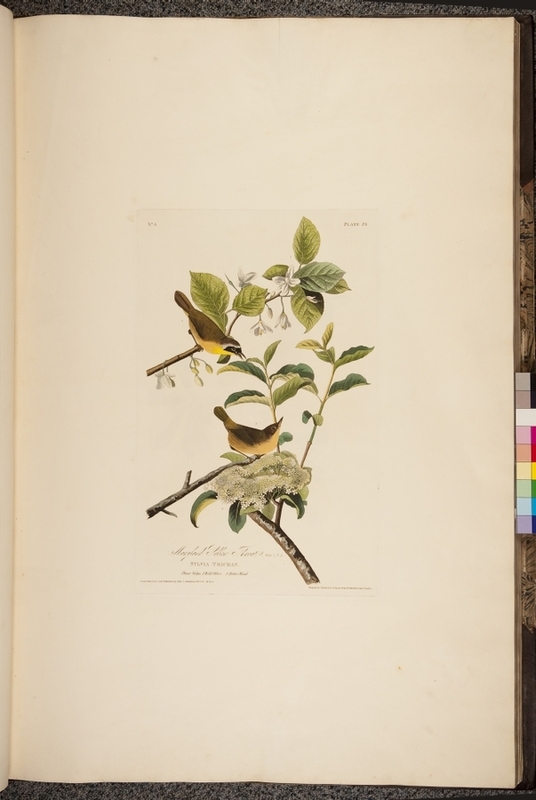 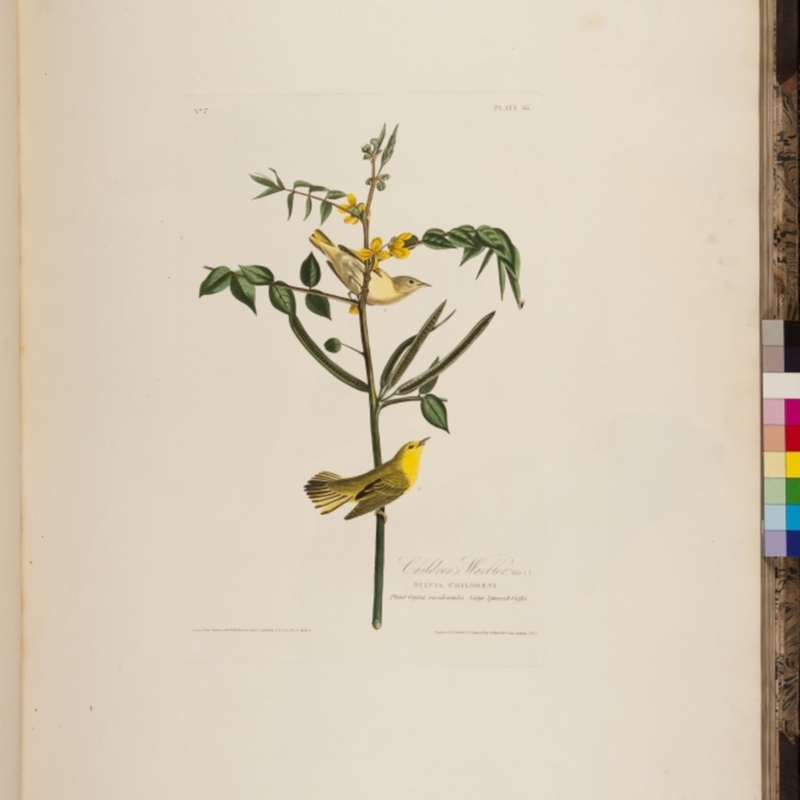 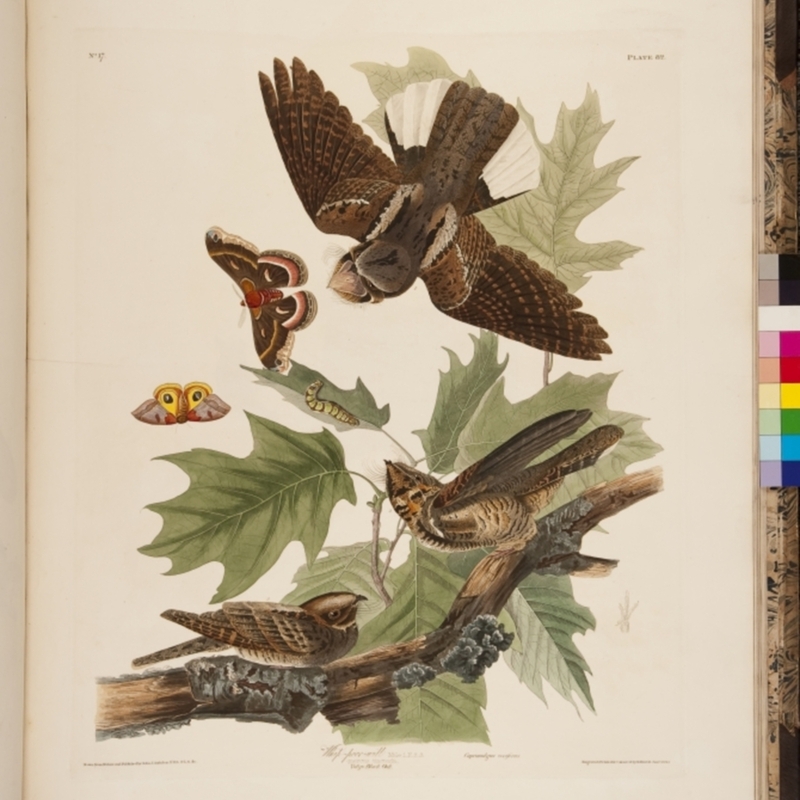 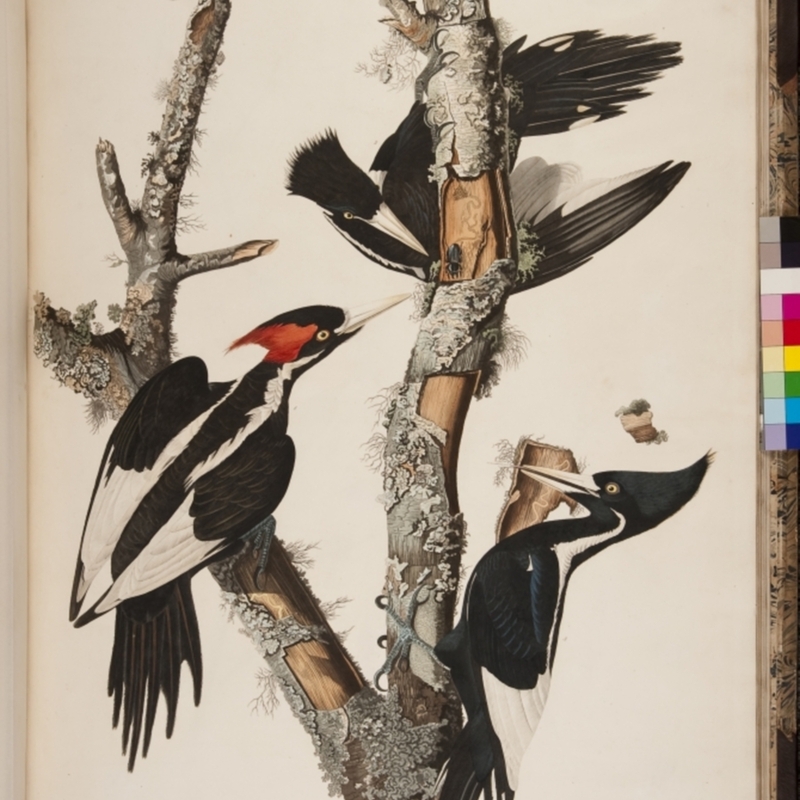 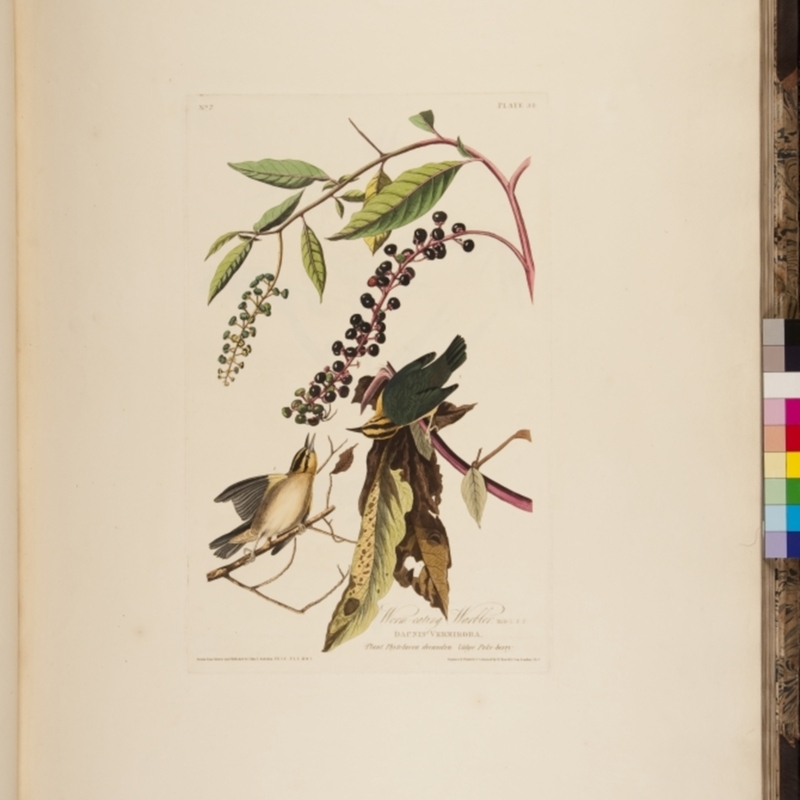 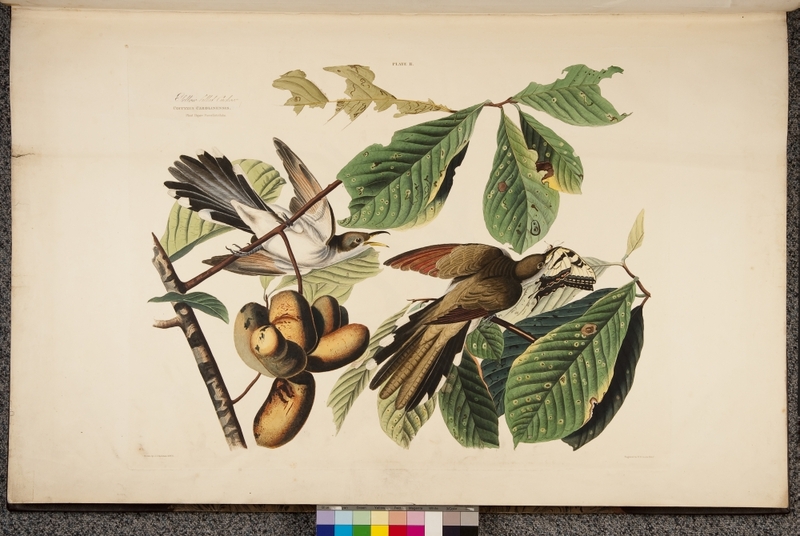 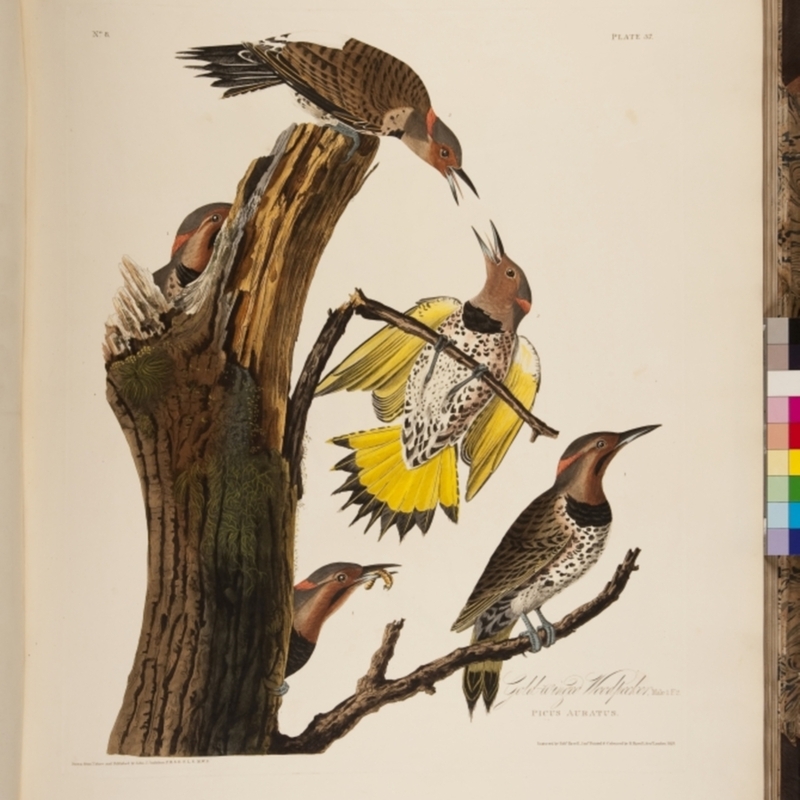 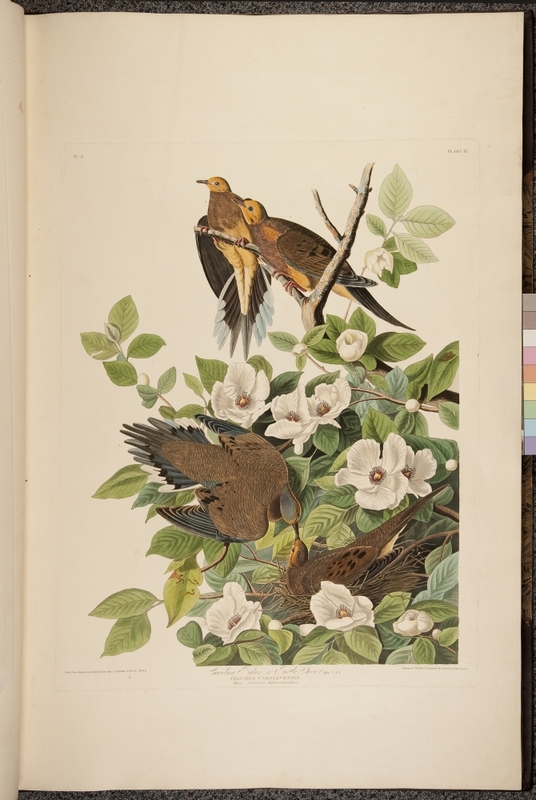 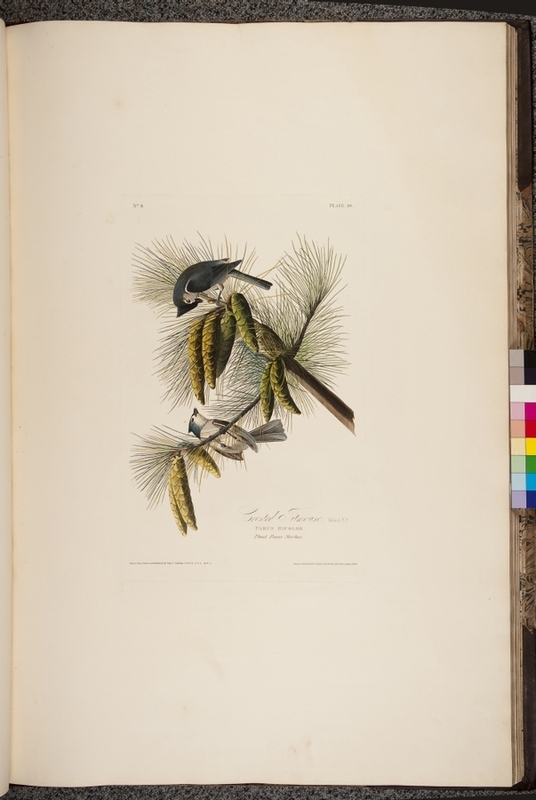 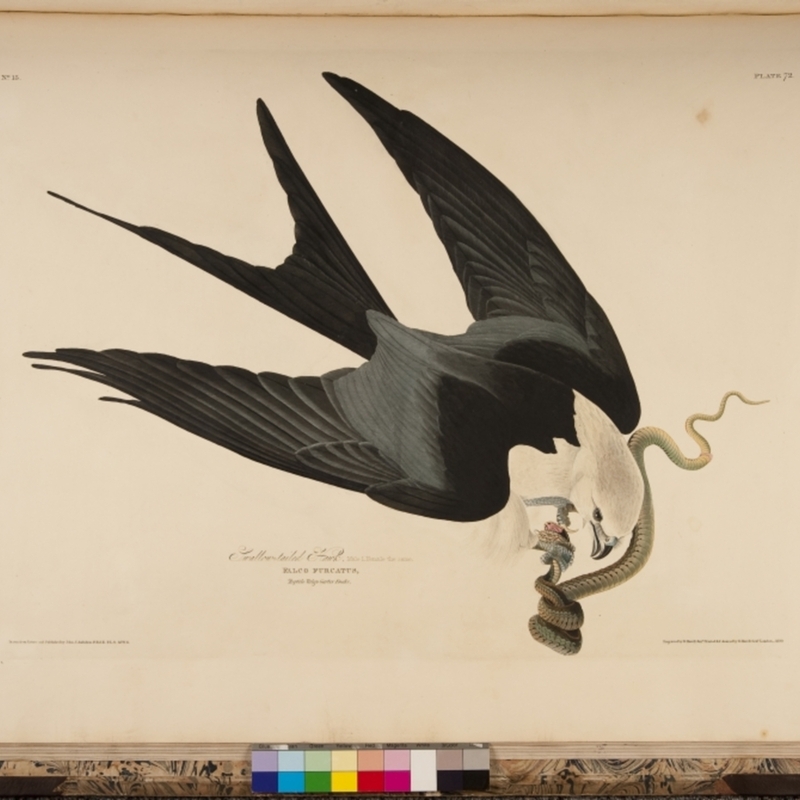 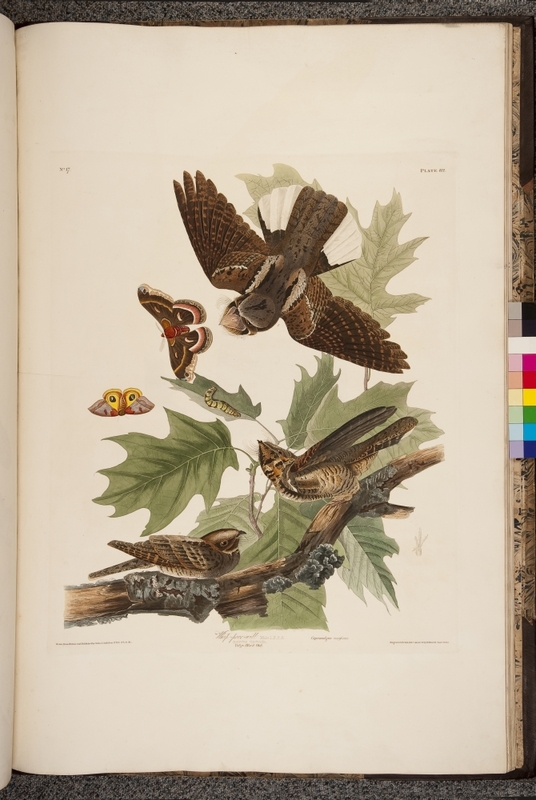 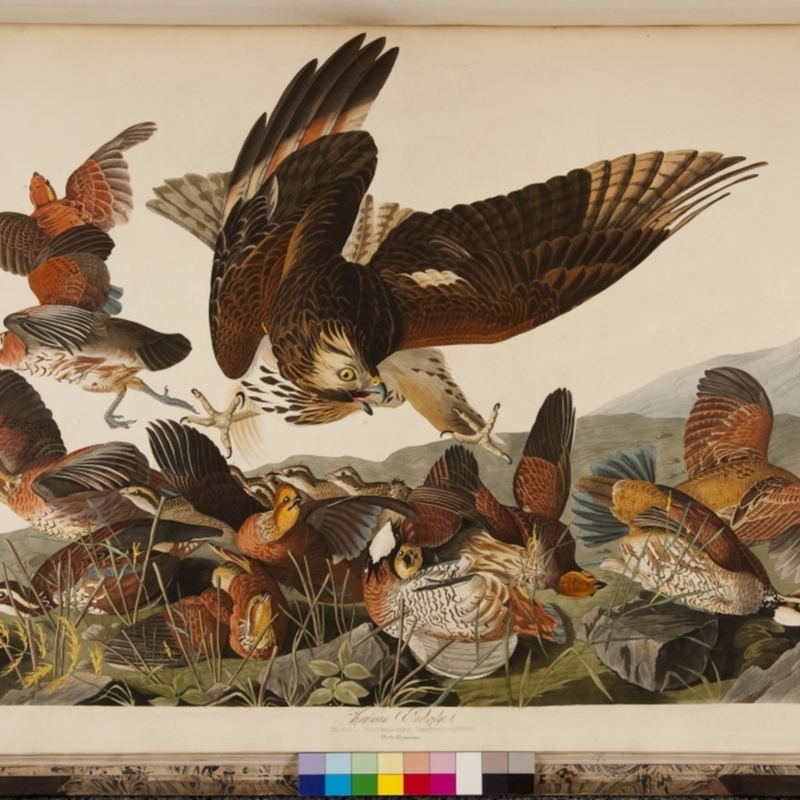 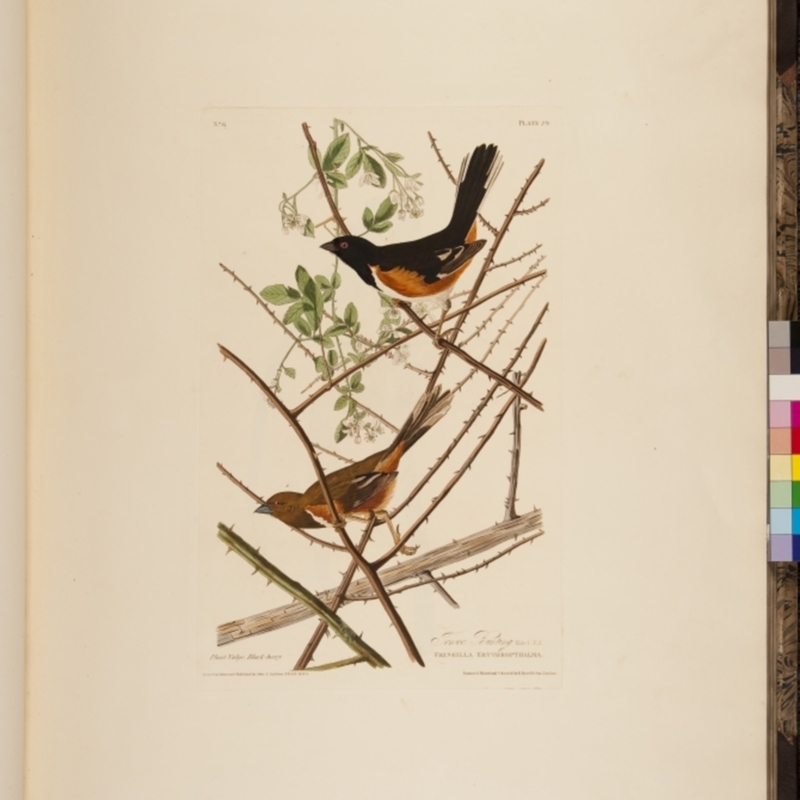 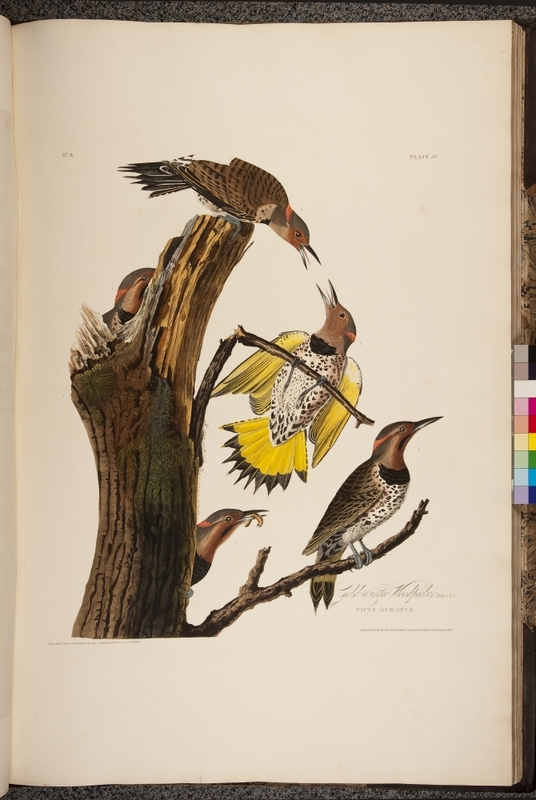 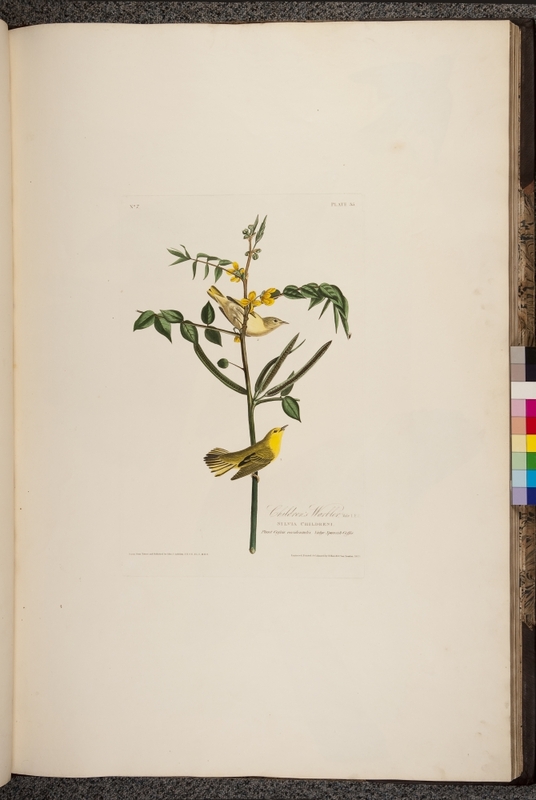 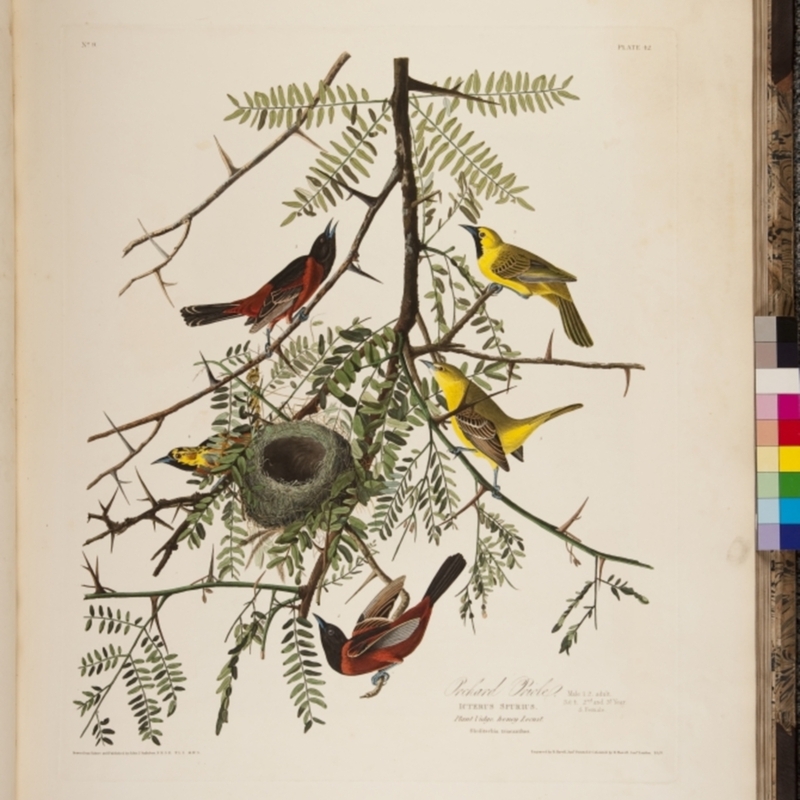 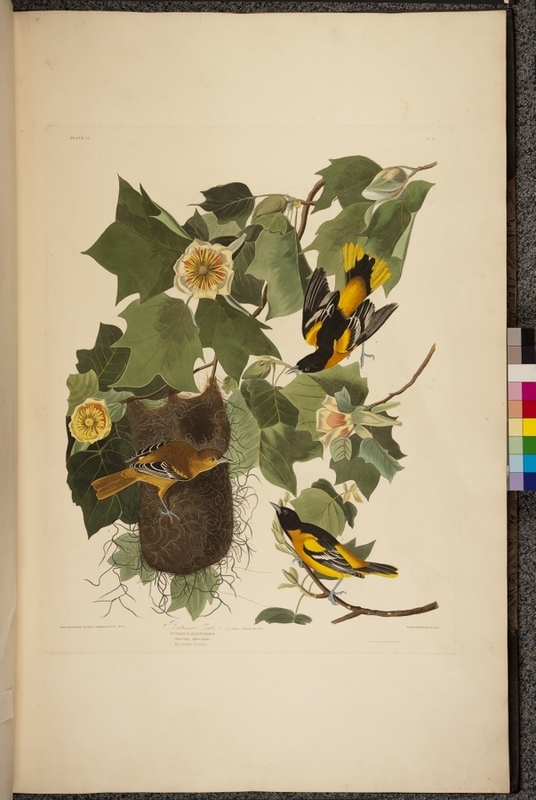 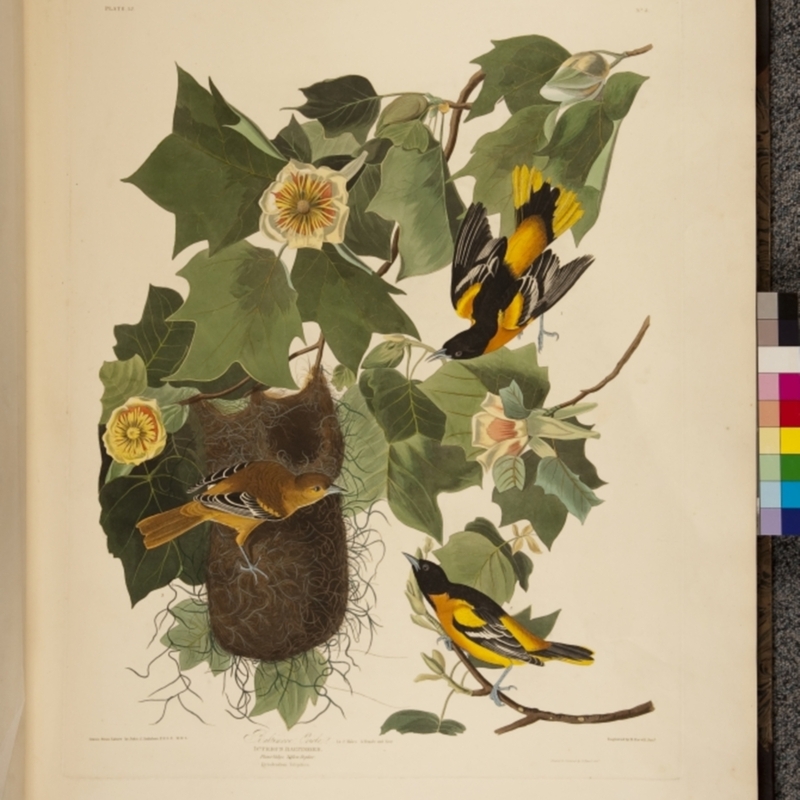 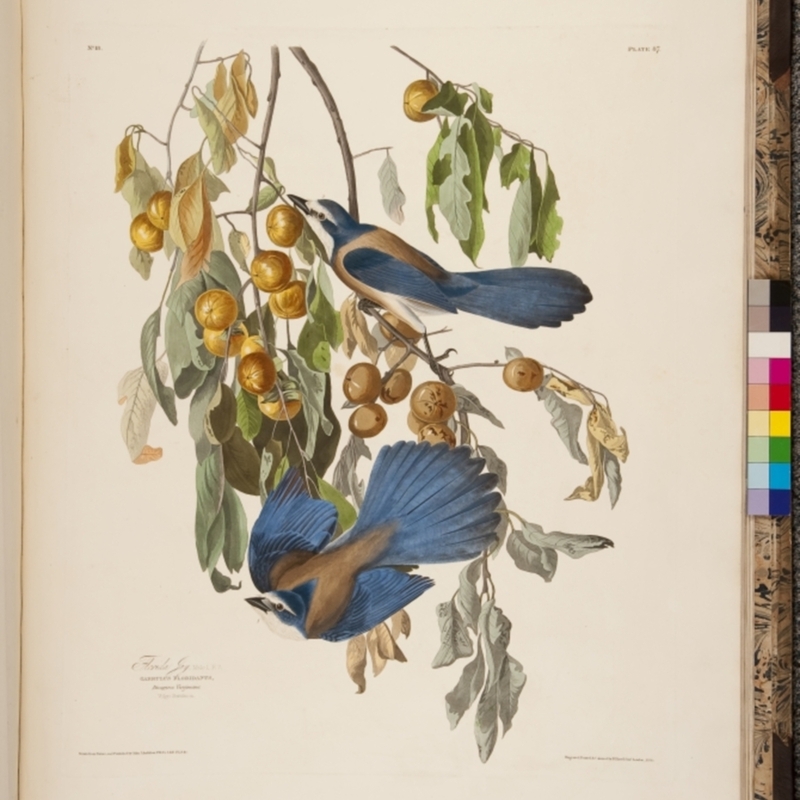 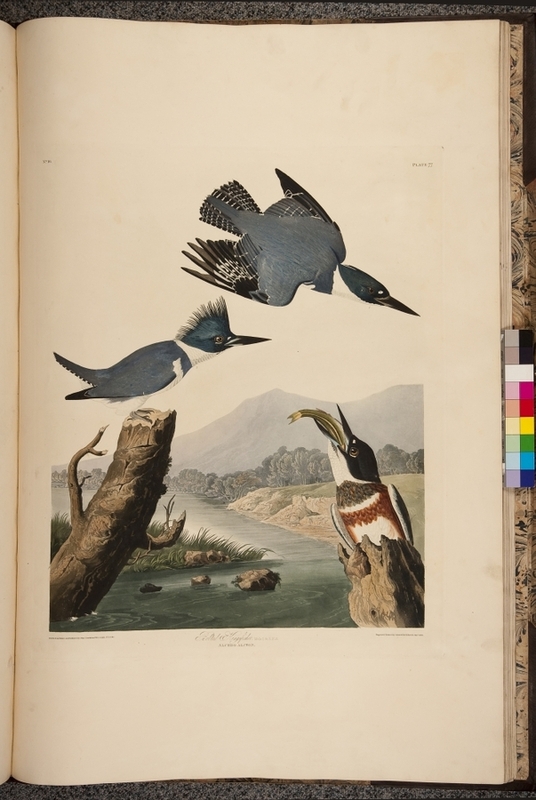 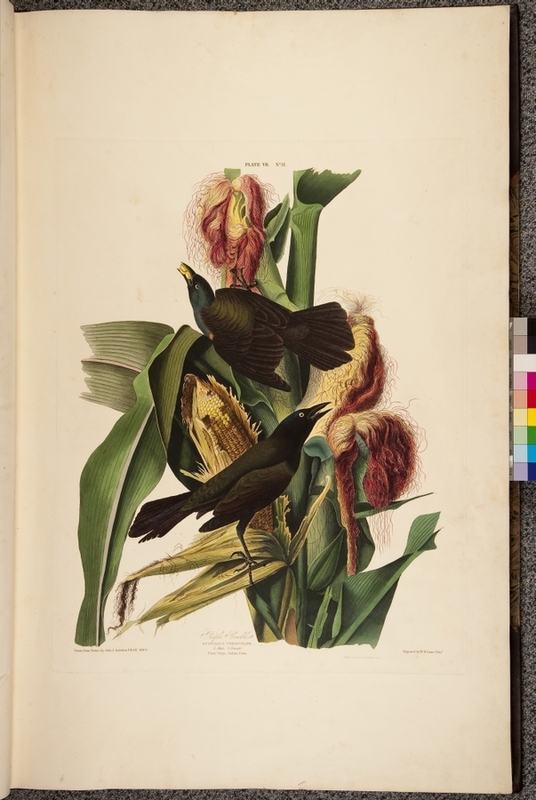 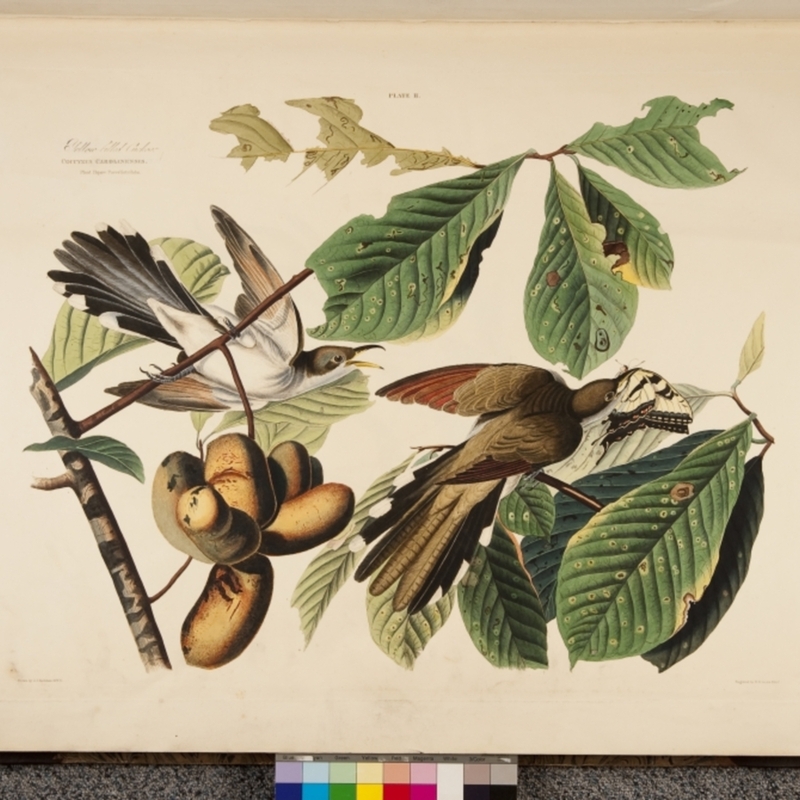 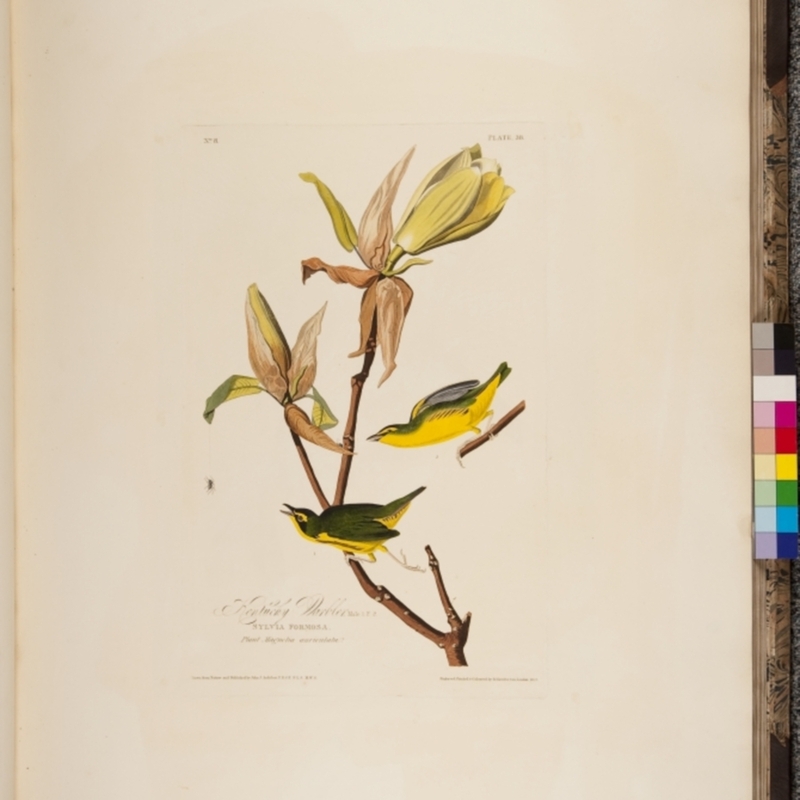 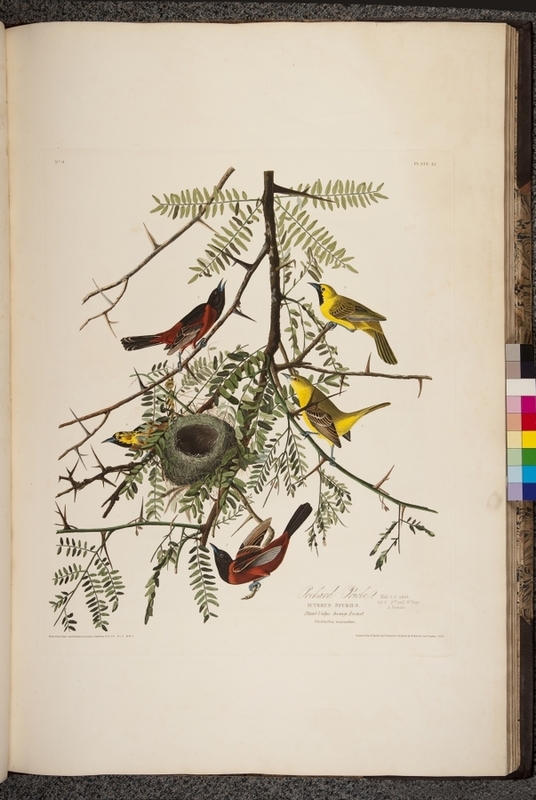 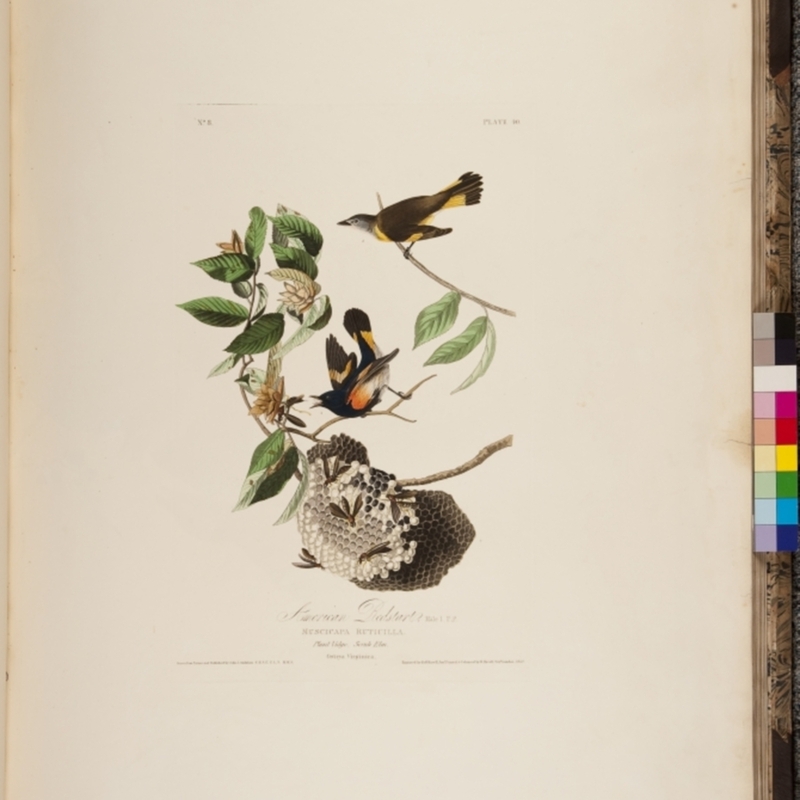 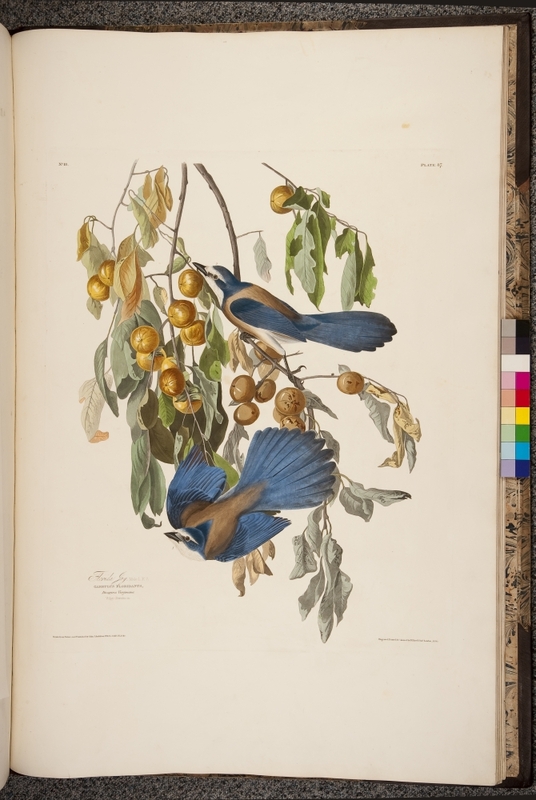 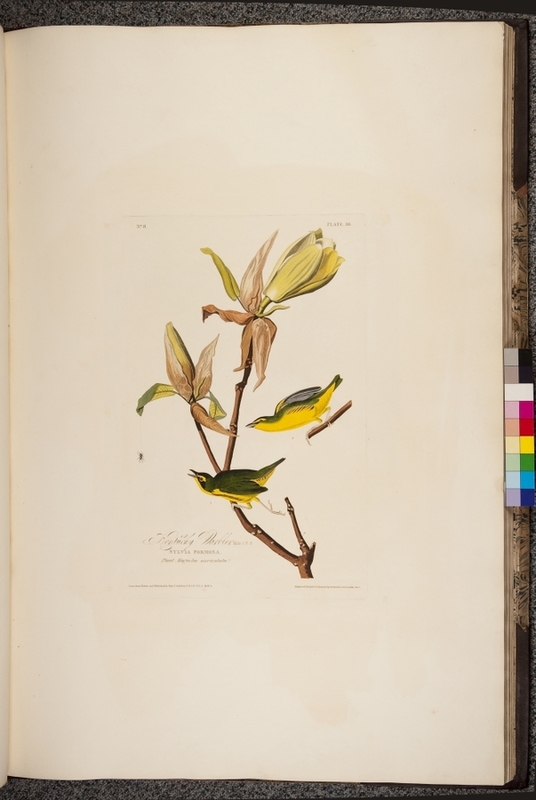 Audubon; John-James (1785-1851); Ornithologist; artist et al., “The Birds of America,” Heritage, accessed April 23, 2019, https://heritage.rcpsg.ac.uk/items/show/773. 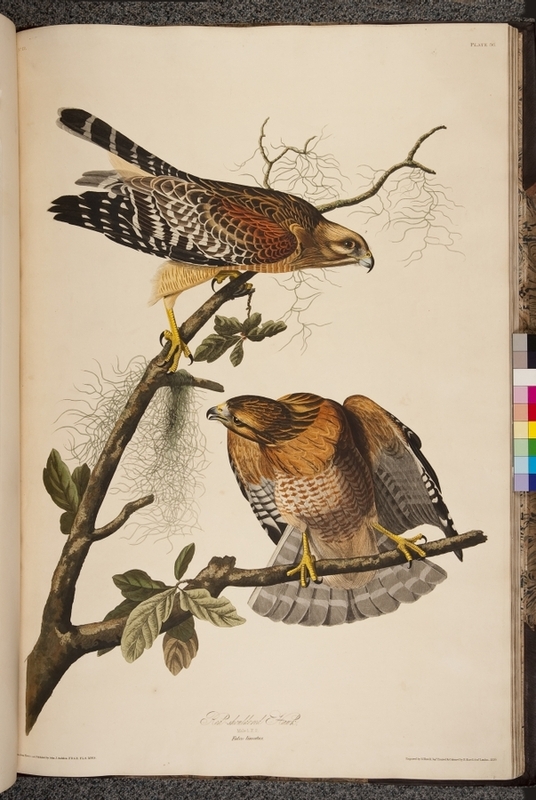 Description: The birds of America : from original drawings / by John James Audubon, Fellow of the Royal Societies of London & Edinburgh and of the Linnean & Zoological Societies of London[,] Member of the Natural History Society of Paris, of the Lyceum of New York, &c. &c. &c.